We are so excited about all of the things coming up in March! 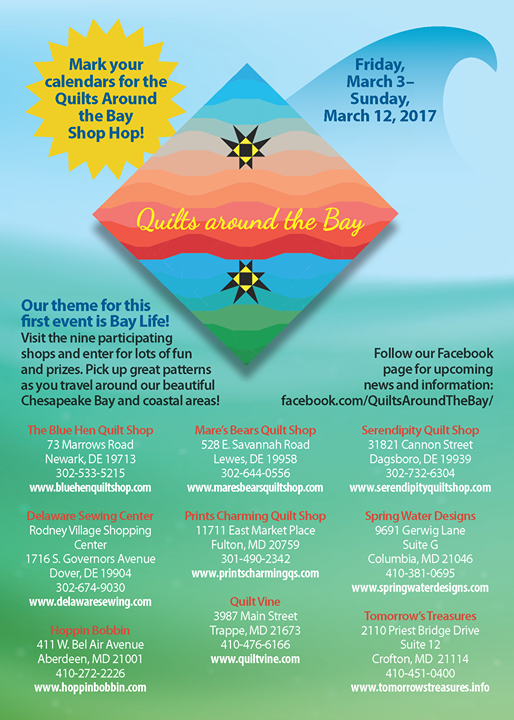 Shop Hop is March 3rd-12th and has some fabulous shops participating with us. The Southern Comforters Guild show is the next to the last weekend and then off to Lancaster. While March is really busy, February has been busy for us in getting ready for it. There will be time to sleep when it is all over, I hope. 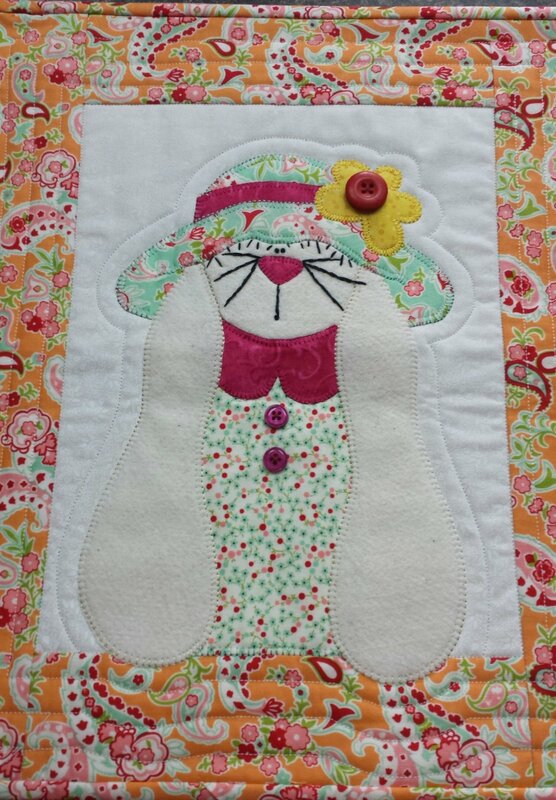 Beginner Quilters: Don't forget your class dates are Wednesday, February 22nd at 2pm or Thursday, February 23rd at 5pm. Join us to win fabulous prizes. Each shop will have a registry for you to win a gift basket from their shop, filled with lots of quilting goodies. Plus, you receive that shops Quilt Block pattern for free for walking in the door. Get your passports stamped and visit all 9 shops and be eligible to win our Grand Prizes! Plus if you visit all 9 shops, you will receive a coupon worth 10% off purchases at any of the 9 shops through February 28th, 2018. (some exclusions may apply) Plan your Hop today! 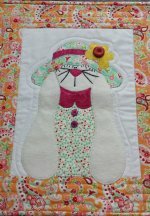 You can also see all of the other quilts and blocks by clicking here to visit our Facebook page. Click here to view the link that lists all shops and their addresses. These are our Quilts Around the Bay Block and Setting. The Monarch Butterfly pattern is yours for Free when you come in to Hoppin Bobbin March 3-12th. Kits will also be available, for purchase, for our Block, Setting Pattern and Setting fabrics. Can't wait to see you! This is the continuation of our club that ran from September 2016- February 2017. While you can join this club if you have not attended before, we recommend that you attend our club that starts from the beginning. Click on class title for complete list of dates and projects and more information. A traditional Storm at Sea Quilt has illusions that makes you see different patterns from every direction. No curved piecing and it is made easy using the templates from Marti Michell. The From Marti and Me Club is perfect for an advanced beginner or a refresher for the quilter that wants to brush up or advance their skills. Join this great club as a way to expand all of your quilting skills. Learn ways to make that perfect block or project using Marti Michell’s patterns and tools during a monthly demo that includes an exclusive pattern. The engineered corners on her tools, take all of the guessing out of piecing and make cutting and sewing your projects easy and fun. Projects range from table toppers and wall hangings to full size quilts and most patterns offer multiple sizes to make the one that suits your needs. Click on class title for complete list of dates and projects and more information. Beginner Quilters: Don't forget your class dates are Wednesday, March 15th at 2pm or Thursday, March 16th at 5pm. The From Marti and Me Club is perfect for an advanced beginner or a refresher for the quilter that wants to brush up or advance their skills. Join this great club as a way to expand all of your quilting skills. 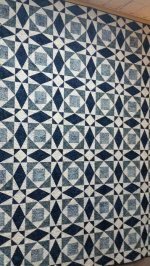 Learn ways to make that perfect block or project using Marti Michells patterns and tools during a monthly demo that includes an exclusive pattern. The engineered corners on her tools, take all of the guessing out of piecing and make cutting and sewing your projects easy and fun. Projects range from table toppers and wall hangings to full size quilts and most patterns offer multiple sizes to make the one that suits your needs. Here’s a project for those of you looking for a challenge. It’s not really a traditional log cabin but a version of a log cabin otherwise known as courthouse steps. This awesome quilt is a play on dark and light, super scrappy and fat quarter friendly. For the Very Confident Beginner to Advanced quilter. The sample in the store is made in green and purple batiks, don’t limit yourself to those colors use your favorites and make it your own. 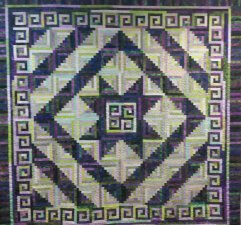 The only thing to keep in mind is contrast no mediums in this quilt just lights and darks, come join the class and show us your favorite colors! 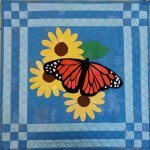 March 29th -April 1st is Lancaster Quilt Week. While the shop will be open these days, we will also be vending at the Continental Inn in Lancaster. IF you want to see what is coming up in a calendar setting, click here to view our full calendar. Keep an eye on the calendar! 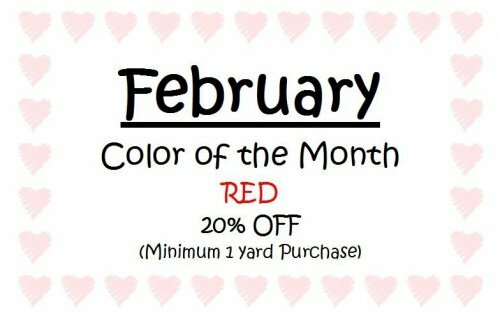 New Fabrics and Kits added to the Sale Rack this week.